If you've been reading this blog for any length of time, you've no doubt noticed I have a thing for family sagas. Give me a thick, juicy multi-generational tale and you won't see me for hours. Stories like that just have it all—adventure, romance, mystery, suspense, etc. Have you ever considered that these same elements exist in everyone's family? That your own history may be just as exciting—perhaps even more so—than those you read about in books? It's true. With a little bit of digging, you can uncover remarkable stories about your own ancestors. Better yet? You can do it while sitting at home in your PJs. Check out familysearch.org, a free, user-friendly site where you can build your family tree, search thousands of historical records, and collaborate with others to piece together the stories of your ancestors. Don't be surprised if after running a few searches you find yourself completely addicted to researching your family history. It's fun, fascinating stuff. It can also be frustrating and, at some point, you will probably need some professional advice to help you flush out hard-to-find ancestors. This is where conferences come in. I attended RootsTech a couple years ago; it was helpful, but I actually learned more from the 2016 Conference on Family History & Genealogy at Brigham Young University, which I attended last week. The annual event's smaller, more intimate setting kept me from feeling too overwhelmed, but I still came away from it with some great information and helpful hints and tools to use in my own research. The conference stretched over four days and offered classes for genealogists at the beginner, intermediate, and advanced levels. A large variety of topics were discussed, including how to track immigrant ancestors across the pond, how to search un-indexed probate records, ways to do family history work on your phone/tablet, and different approaches to publishing your own story. There was also a track for teens as well as one for those trying to complete ICAPGen requirements. Classes were taught by genealogy professionals with years of experience. I especially enjoyed classes taught by Michael Strauss, Lisa Louise Cooke, and Paul Milner. The keynote addresses this year were also excellent. Paul Cardall, a concert pianist with congenital heart disease, gave an inspiring talk about how researching his wife's roots in Slovenia changed his life. Steve Rockwood, president/CEO of FamilySearch, also gave a touching presentation about making family history more accessible to people all over the globe. "We are here to save families," he said, "and to save the family." Thanks to BYU, my husband and I ("official conference bloggers") were able to lunch in the Morrison Center cafeteria every day. When we were poor college students, we used to pool our pennies and buy ice cream sundaes there to share, so it was a blast from the past. It also gave us the opportunity to get to know other attendees, like Diana and Nicole from the Family Locket (they have a fun book club feature you might want to check out). We enjoyed swapping stories and family history tips with all our tablemates. As you can tell, my husband and I thoroughly enjoyed the conference this year. We also had fun just being back on BYU campus, where we met each other as freshmen in 1994. If you've never been to Provo, you're missing out. It's a beautiful, family-friendly city surrounded by towering mountains. Although my favorite time to be in Utah Valley is during the splendorous Fall season, summer is an excellent time to visit as well. 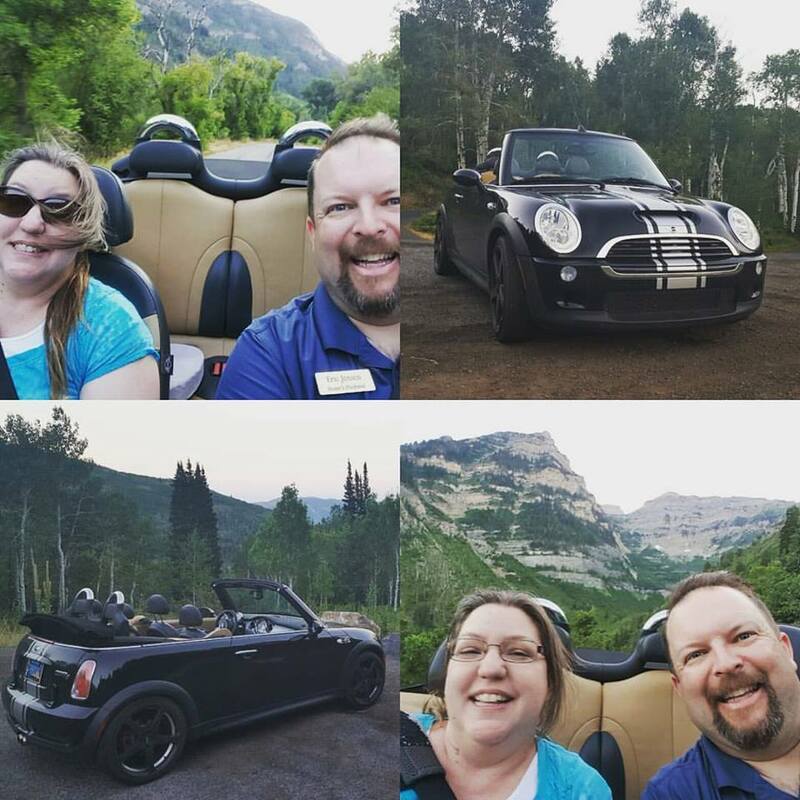 The nights cool off nicely, making the evenings perfect for enjoying a drive up the canyon, taking in a play at Sundance, or exploring the restaurants and shops downtown. BYU is also a fun place to roam around. It has a large family history center, free museums, a bowling alley, and, most important of all, the BYU Creamery. I worked at the original Deseret Towers location for two years, so I can say with authority that it has the best ice cream in town (I recommend Pralines and Caramel and Bishop's Bash). One word of warning: if you're planning to attend the conference next year (and you totally should), bring a seat cushion. Your buns will thank you. Also, if you're cruising up from Arizona, consider driving a convertible. We traveled in my husband's Mini Cooper and had a blast zipping through the desert. As we rounded both Mormon Lake and Jacob Lake, we got to inhale the most intoxicating elixir ever—pine mixed with rain—while blasts of cool wind ripped through our hair and our faces got misted with rain. Pure heaven. Many thanks to BYU and to Mormon Life Hacker for this fabulous opportunity. We loved this year's informative, enjoyable conference. We're looking forward to doing it again next year! Fun! It sounds like you had a blast. Too bad we couldn't squeeze a visit in. Yeah, with the conference and visiting family, our schedule was pretty tight. Next time I'm in the area, let's get together for sure! So great to meet you!! !